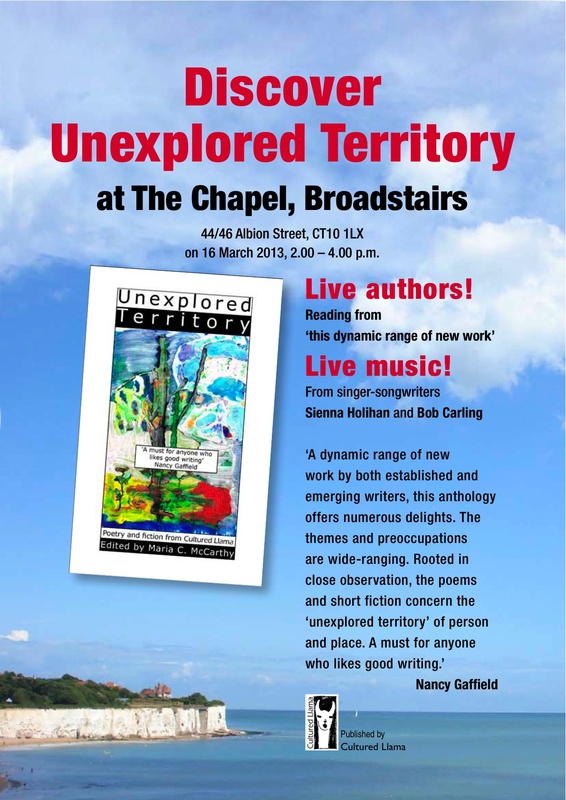 Another opportunity to hear my Karaoke Poetry as well as other readings from Unexplored Territory, edited by Maria C. McCarthy and published by Kent publisher Cultured Llama. The book is anthology of poetry and fiction that includes such fabulous writers as June English, Maggie Harris, Mark Holihan, Luigi Marchini, Gillian Moyes, Bethany W. Pope and Fiona Sinclair among others. The latest celebration of a wonderful publication is at The Chapel, 44/46 Albion Street, Broadstairs CT10 1LX, Saturday 16 March, 2pm to 4pm. Readers from the book will be joined by musicians Bob Carling and Sienna Holihan. I’ll be there too, with my karaoke backing tracks, to read the first three poems in the Karaoke Poetry series. All welcome, so please join us. Or if you can’t come along, the book is available from the Cultured Llama website.